In 1680, an English pirate captured a Spanish ship near Panama, neglecting a trove of unrefined silver but seizing an atlas of Pacific Ocean sailing charts and maps. On receiving it, King Charles II of England made him a captain in the Royal Navy. 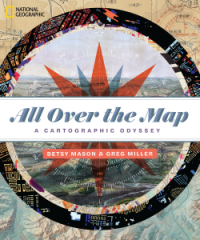 Betsy Mason and Greg Miller recount this and dozens of other fascinating tales in All Over the Map, illuminating worlds both real and imagined.